Stand out from the pack with original handcrafted copper sinks made entirely out of recycled and repurposed copper. Crafted by master coppersmiths, the sinks from Copper Sinks Online bring you into the green building movement with style and elegance, making more than just a design statement. Our unique and stunning sinks support the efforts of skilled artisans and their craft, all while transforming wires, pipes and discarded copper construction materials, which might otherwise go into a landfill, into a must-have addition to your home décor. This reclaimed copper is melted down, and purified into its original pure elemental state, before being masterfully hammered and shaped in an open forge into the superior pieces of functional art you see here. For an eco-conscious and distinctive accent to your home’s style, Copper Sinks Online gives you the best in selection, value, and craftsmanship. When considering the most beautiful, durable, and environmentally conscious choices you can make in designing your home’s style, copper is the leading choice. 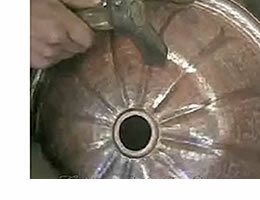 For over ten thousand years, mankind has been mining this incredible metal from deep within the Earth, but now we are able to enjoy its luster and utility in home sinks made only from reclaimed, recycled, and repurposed copper. Used throughout history for everything from primitive tools, to ancient plumbing systems (still in good condition 5000 years later!) to the hulls of early American warships, this miraculous metal has become part of the fabric of our civilization. Copper is a metal of infinite usefulness and sustainability, since it can be melted, reforged, and reshaped over and over again, never needing to be thrown away or wasted like so many other materials. In this way, you are not only supporting the green building movement today, but laying the foundation for its future. Each of our copper sinks is handmade to the highest standards by individual artisans, practicing the centuries-old craft of coppersmithing. Recycled materials are melted, purified and refined into high grade copper, before being hammered in an open copper forge into one-of-a-kind pieces of art. Our artisans are paid fair trade wages for each unique sink, ensuring not only environmental sustainability, but social renewal and excellent artistry as well. The satisfaction of owning high-quality copper continues in your day-to-day use, as you watch your beautiful sink mature over time, developing the much sought-after “patina” that gives it its deep, lustrous glow. Copper is naturally antibacterial, uncommonly durable, and timelessly beautiful, making it a worthy investment in the value of your home, your daily comfort, and your peace of mind. 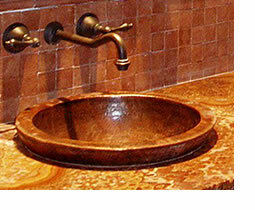 Take comfort in knowing you are the owner an artfully crafted, sustainably produced, and high quality piece of fine functional art, when you put your trust in Copper Sinks Online.